Update: For a quick list of helpful links to red tide status and beach conditions, you can scroll to the end! The 2018 – 2019 Red Tide bloom has stacked up to be one of the worst blooms on record. It is devastating for local communities and tough on coastal economies. It is heart-breaking to observe the impact on marine life, shellfish aquaculture and working waterfronts. But it is important to remember that severe red tide blooms have happened before, and although it takes some time, the marine ecosystem typically recovers. 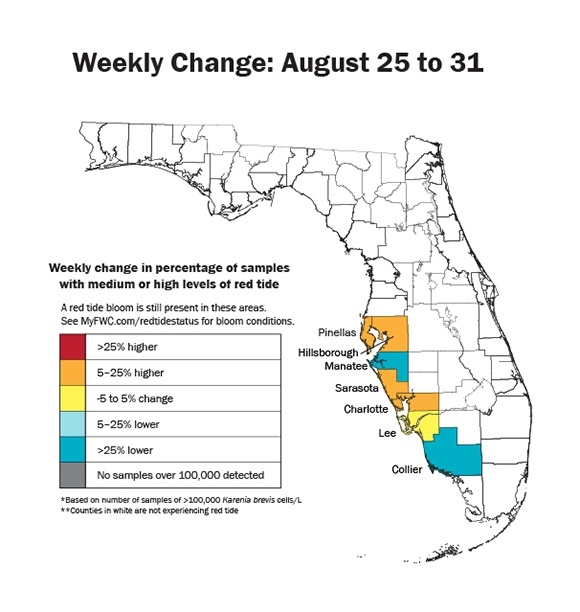 It is a helpless feeling to watch something like this take place, but it helps to stay informed and know that there are multiple agencies and a lot of very smart people focused on red tide research, future prediction and potential solutions. We get a lot of questions about red tide in southwest Florida…especially during blooms like this one. A Google search can be overwhelming and many people don’t know where to start or how to interpret the results. While this is not a comprehensive overview of all red tide research, here are a few of the most informative websites around. Bookmark them for easy access to status and forecasting of red tide events. FWC/FWRI has an entire research group dedicated to harmful algal blooms. This team provides regular updates on the status of red tide in Florida. The Florida Fish and Wildlife Conservation Commission Fish and Wildlife Research Institute has an entire team of scientists dedicated to harmful algal bloom research. In addition, they have a volunteer program that helps provide greater sampling coverage throughout the year. FWC provides regular updates on current red tide status for the state of Florida: myfwc.com/redtidestatus. 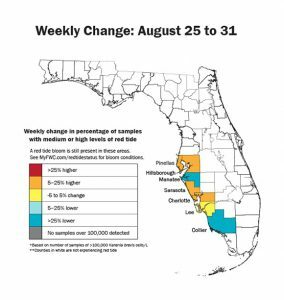 The Ocean Circulation Group with the University of South Florida’s College of Marine Science provides trajectories of red tide conditions on the West Florida Shelf, allowing stakeholders to predict where red tide is headed next. FWC also has multiple resources online as related to the biology and history of Florida’s red tide: myfwc.com/research/redtide/faq/. Their scientists have published dozens of papers on this topic and FWRI’s digital library is available for anyone who wants to delve deeper into the science. Another very useful site is the University of South Florida’s College of Marine Science Ocean Circulation Group, which models the transport of bloom conditions at the surface and at the bottom of the water column. This interactive map allows visitors to click on their area of interest and view the best prediction of where the red tide is headed on the West Florida Shelf: ocgweb.marine.usf.edu/hab_tracking/HAB_trajectories.html. 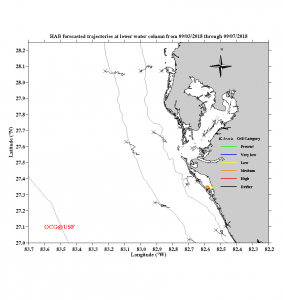 This collaborative effort between USF and FWRI combines the expertise of oceanographers and biologists to provide stakeholders with a relevant and up-to-date idea of what conditions to expect in the near future. Harmful algal blooms are also tracked at the federal level, and NOAA has multiple sites for red tide information. Cell counts and bloom status reports are available through the Harmful Algal Blooms Observing System (HABSOS) and NOAA also issues twice weekly forecasts that allow us to monitor ongoing harmful algae blooms. NOAA’s Harmful Algal Blooms Observing System provides an interactive map that displays cell count reports and allows users to observe bloom conditions by location, species and time frame. Mote Marine Lab also has an excellent site dedicated to red tide facts and updates: https://mote.org/news/florida-red-tide. We are lucky to live in a time where so many digital resources are available to keep us informed. That is one small consolation during this devastating bloom. Stay informed and keep tabs on the good science that is out there and continues to make new strides every day. Additional resources: Kirkpatrick, B. et al. 2004. Literature Review of Florida Red Tide: Implications for Human Health Effects. Harmful Algae 3: 99 – 115. Florida Sea Grant. 2018. Understanding Florida’s Red Tide. Angela Collins, PhD | Florida Sea Grant & UF IFAS Extension | Manatee County Government | (941) 722-4524 | abcollins@ufl. edu.